This Quietway route links Elephant and Castle to Crystal Palace. Sections in Lambeth include Turney Road, Rosendale Road, Clive Road, Hamilton Road, Paxton Place and Gipsy Hill. The consultation closes on Monday 12 March. This Quietway 7 final consultation is about the details of the route. They include new zebra crossings, new parallel cycling zebra crossings, replacing speed cushions with sinusoidal humps, introducing continuous footway treatments at junctions, replacing two mini-roundabouts with priority junctions, building-out footways, new advisory cycle lanes and permitting two-way cycling on a one-way street. 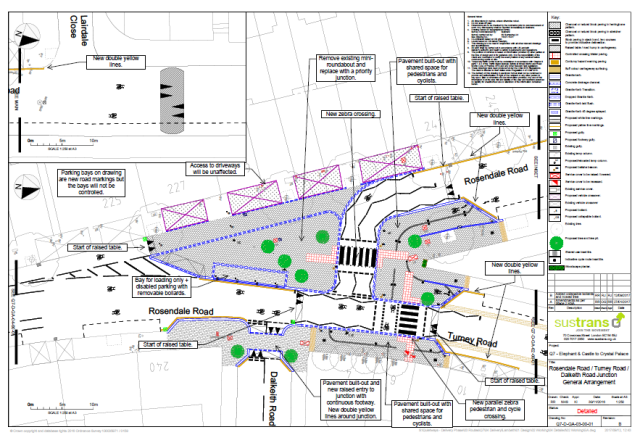 How safe will Rosendale Road be for children and people new to riding bikes? Lambeth Cyclists think the proposals do not go far enough given the aim that Quietways will 'network of high quality, well signed cycle routes throughout London, mostly using backstreets. The routes will link key destinations and are designed to appeal to new and existing cyclists who want to use quieter, low-traffic routes.' We thin much more is needed in the Turney Road and Rosendale Road areas.